From our earliest days of learning to eat by ourselves, we use utensils. Children begin the process by using their fingers. Then they graduate to spoons, forks and, finally, they are allowed to cut their own food with a knife. Teaching proper knife use means teaching knife safety at the same time. This responsibility begins with parents and guardians and it doesn’t end with one casual lesson. Learning requires the three Rs … repetition, reinforcement and role models. And when it comes to knives, let’s wrap those three in another R … respect. Safe knife use begins with the clear message that knives are tools, not toys. A great place to teach knife safety is in the kitchen. Allow your children to help with meal preparation. Teach them to use cutting boards so blades are not chipped or bent and counter tops are not damaged. They will learn that French chef knives, steak knives, paring knives and bread knives work best when used for their special tasks. If your first lessons are in the workshop, you can teach your child about using knives to strip electrical wire or clean spark plugs. Likewise, if your family hikes, bikes, canoes, camps or fishes, children can be taught about multi-tools, fillet knives, hunting knives and small folding knives for repairs, cutting rope and whittling. 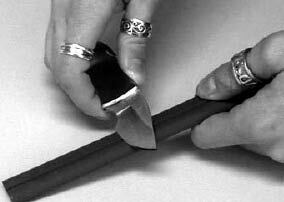 Knife sharpening and knife care have basic rules. Teach them, reinforce them when necessary and follow your own rules. When your actions match your words, you have the most powerful teaching tool of all, the power of the positive role model. Finally, respect zero-tolerance policies established by local schools. If your children attend public or private schools, assume the school has a zero-tolerance policy about carrying knives on school grounds, to school events or inside school buildings. Do not assume teachers or principals verbalize this rule. You do not want your child to be a local test case so you should clearly explain the rule to them and expect them to follow it.